What is the Montessori approach to pretend play, imagination and fantasy? Dr Montessori has been recorded as preferring reality to pretend play in the classroom. The most commonly referenced is when she introduced traditional toys in her classroom. She found that children gravitated instead to the real thing. For example, rather than playing in a pretend kitchen, the children wanted to prepare real food. She therefore chose to remove traditional toys from the classroom, keeping those based in reality. Practical life activities became a fundamental part of the Montessori classroom. Many parents then wonder how much pretend play they should encourage in the home. As I see it, there is a difference in a Montessori approach to pretend play depending on if it’s pretend play stemming from imagination or from fantasy. Let me be clear. This is my personal interpretation of the Montessori approach to imagination and fantasy and is based on my own children and work with children in my classes. No matter if you reach a different conclusion, I support you and your choices. We are all doing the best we can with the information we have available. The Montessori approach holds that it is easiest for children under 6 to understand, process and relate to things that they find in the world around them. They have a very concrete understanding of the world at this age. What they see, touch, smell, feel is the easiest form for them to understand. For example, if they see an excavator at work in the street, they may then be attracted to working with a model of an excavator, to reading books about construction vehicles and to play based on this. This is a child’s imagination at work. From observing my own and other children at play, I see a lot of value in children playing “house”, “school”, and other daily life scenarios. To me this is their way of processing the world around them. They see something happen at home, and then they “play” with a sibling, friend or soft toy to act this out. This is different to play based in fantasy, for example, fairies, superheroes, fictitious animated characters, and things that have little basis in reality. Let’s not mention merchandising (I’ve never been a big fan myself). A child who spends too much time in a world of fantasy may find it difficult to relate to others, to interact in a group, to be in the here and now. It can also be very scary for the child. My son was terrified when he was around 4 years old and heard an audio book in my mother’s car one day of “Snow White and the Seven Dwarves”. To him the wicked witch was a real person, an apple could be poisoned, and you could fall asleep for 100 years. When a child under 5 or 6 hears a fairy tale with a wicked witch, they then also imagine this witch to be real as a child of this age has a very concrete understanding of the world. They visualise it as if it is real as they are not yet able to clearly separate fantasy from reality. This is where I would suggest that we limit exposure to fantasy to children under 5 or 6, until they are old enough to be able to separate fictitious creations from reality. If young children are exposed to fantasy from time to time then just be mindful that we can talk to them about it, but it can still be very difficult for them to really understand what’s real vs what’s not. Once they move into the second plane of development around 6 years, they are able to understand abstract thought more easily. What about imaginary friends? A child with a wild imagination? Will children have imaginary friends? Quite possibly. Will they imagine things beyond what appears around them? Also possible. What we can do is to feed them with a rich, engaging environment to explore. So they are connected with the real world. And explore from there. So I don’t tell them to stop their fantasy games. Let them play it out. Follow the child. My contribution though is to keep offering reality to keep them grounded. There are many children’s books available which are not based in reality. There are frogs living in houses and walking down the street on two legs; teddy bears driving cars; many books about pirates, princesses and fairies; and so on. From my experience (as I have said before), children enjoy books about their daily life and which are based in reality. They relate to stories about kids doing things that they recognise themselves and have experience with. I will continue to love “Sunshine”, a book with no words, with beautiful realistic pictures of a girl waking up, getting dressed, preparing breakfast with her father, and the family leaving for their day. The kids in my class love it. And we read it over and over again. Do I think we should never read books then that are not based in reality? I do read them with young children from time to time and make it clear that this is pretend. It’s a concept they will build to understand and I ask questions like “Do bears really talk/drive cars/wear clothes? Noooo.” I make it a bit like a game which I repeat each time we come across another example. All that said, this is why you mostly don’t find a pretend corner in a Montessori classroom. What about at home then? It was fun to see my kids when they were smaller pretending to be characters from “The Famous Five” books and playing out great adventures. My kids used Playmobil and Lego to play out real life around them. I guess that’s when we can make conscious choices of what books, media and toys we expose our children to. I often get asked what I think of play kitchens in the home. Dr Montessori would say that children like to be involved in the real thing and invite the children to be involved in food preparation. My favourite example of a play kitchen is from Our Montessori Life here where the IKEA play kitchen is being used as a real kitchen for a child with everything at their height with child-sized materials for them to have success. However, I understand it can be difficult for parents to supervise their child in the kitchen all day, and perhaps there is an argument for them to do pretend play with a play kitchen. It’s really a personal choice. 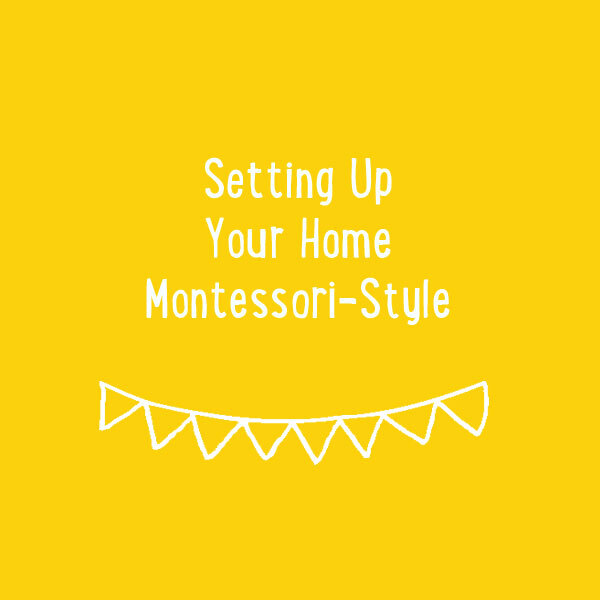 A lecture I attended at the Montessori Congress in 2013, talked about having open ended materials like wooden blocks and scarves for pretend play, rather than a fireman’s outfit, or prescriptive make believe choices. This allows the child full creativity to use these materials in any way their imagination allows. I have chosen to have a block corner in my classroom which are not standard Montessori materials. I love seeing them used in so many ways. Some children make roads, others design buildings and zoos, and others use the blocks to build amazing non-descript structures. The children are deeply focussed on their play and learn to pack away the blocks by shape when they are done. 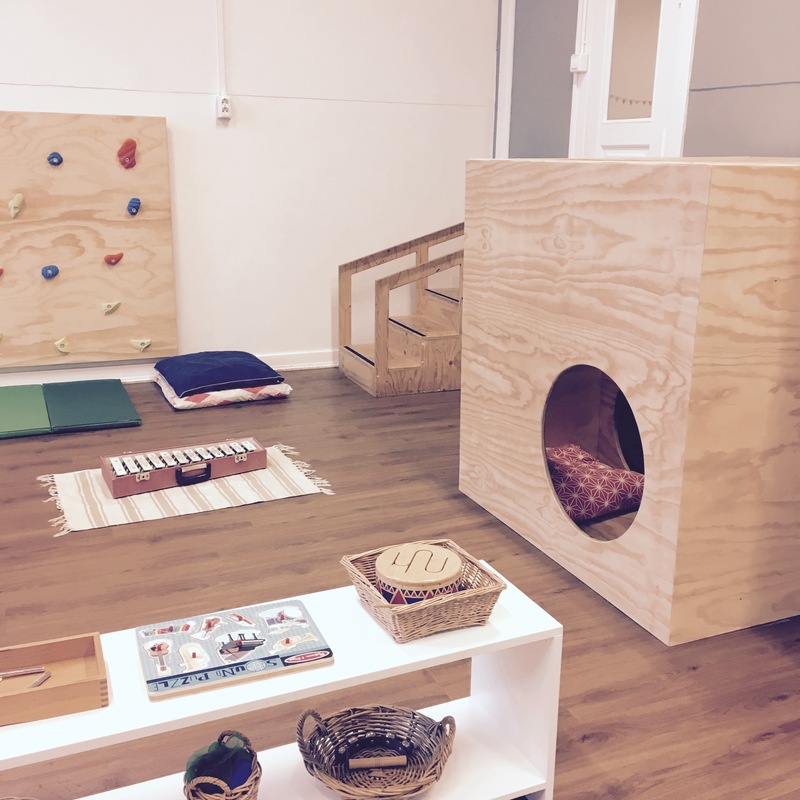 The cosy cube in our playgroup is also an interesting place to observe the children. In the baby class, you observe the babies learning to manoeuvre themselves into and out of the box. In the toddler class, I see children using the box as a quiet place to relax, or for some climbing practise. Then for children who still come to our class above 3 years old, you will often see them using the box as an aeroplane going on holidays or as a shop where the holes are used for serving customers. The farm is often included in a Montessori classroom. We use the farm to learn the names of animals. I will often observe children putting the animals in and out of the farm, “feeding” them or putting them to bed. Unless the child is throwing the materials, using them disrespectfully or interrupting or hurting another child, I allow them to continue working in this way. I can make a note of their interests and see how I could use these to connect them with materials. Or I can make a mental note to do a presentation with the materials at another time so they also learn the purpose of the materials. Montessori and pretend play is a fascinating topic and there are different educational approaches to it. I encourage you to explore and decide what resonates most for you. Adele Diamond has done a lot of research on a program called Tools of the Mind in which pretend play was used to develop executive functioning in children. The Waldorf/Vrije School approach to learning emphasises the role of imagination in learning. 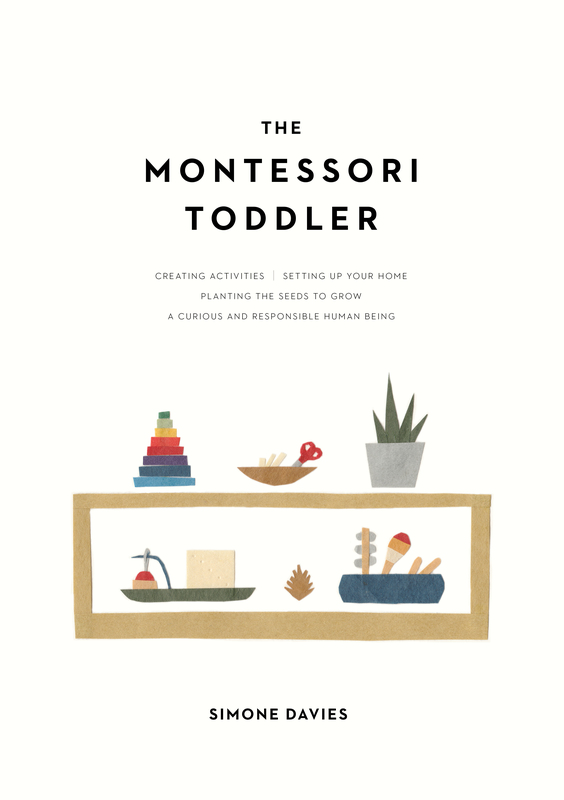 There are two interesting articles I can also point you to for more about Montessori and the imagination and pretend play here and here. What do you think? Does this shift your perspective on how you will encourage pretend play in your child? I’d love to hear.